Amazing Cookies & Cream Oreo Pudding Cookies – So soft and incredibly easy to make. You’ll love the burst of cookies & cream flavor in every bite! When it comes to cookies I am all about a nice soft cookie. Anyone who prefers a crunchy cookie over a soft one, I respect your opinion, but you’re wrong. Once I heard about pudding cookies I was in heaven. Don’t be fooled by the name because these cookies don’t actually include mixed up pudding. You simply use the dry instant pudding mix powder when mixing the ingredients. Apparently, that powder must just be some magical cookie powder, because it’s what keeps the cookies soft! It still blows my mind that I just found out about this secret just over a year ago. We’ll just keep on the train of fun facts about me, an I’ll tell you that I’m also obsessed with anything Oreo flavored. I don’t know what it is about those little sandwich cookies, but I could eat them every day and never get sick of them. When I found out they make an Oreo instant pudding mix, I knew what had to be done. These may not be the prettiest cookies in on the block, but hey didn’t your parents always tell you to never judge a book by it’s cover? 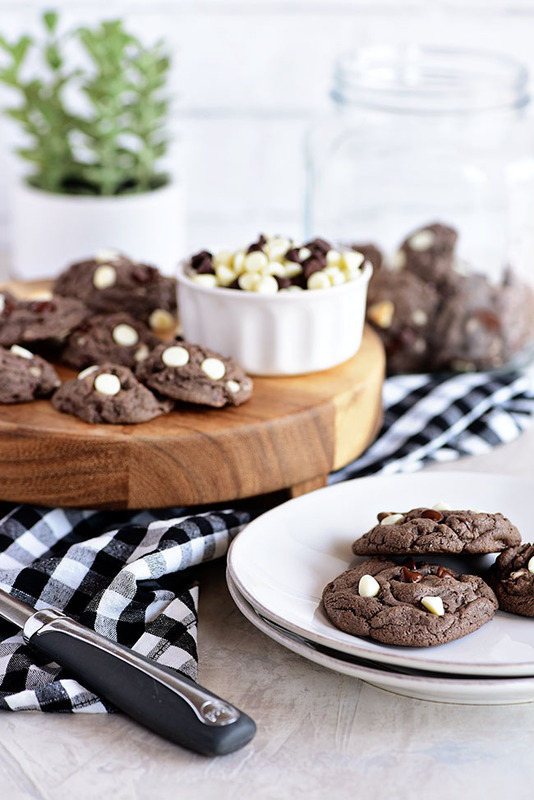 What these Oreo pudding cookies lack in appearance, they make up for in flavor. I think we broke a record in our house for the quickest turn around time on a whole batch of cookies. All of them were gone in a blink of an eye. My boyfriend even requested I throw some in the freezer to save some for him when he comes to visit this weekend. Back to little secrets of this recipe here’s another one of my new favorite little tricks. Don’t be afraid to add the coffee to the recipe. Trust me, I’m not a huge coffee lover, my Starbucks orders usually consist of something that’s mostly milk and sugar. So, I too was hesitant at first to add the coffee, because who would want to ruin this masterpiece with the bitter taste of coffee? That’s not the case at all though! The coffee simply brings out the flavor of the chocolate and makes it this delicious strong and rich chocolate flavor. There’s not a hint of a coffee taste in sight! 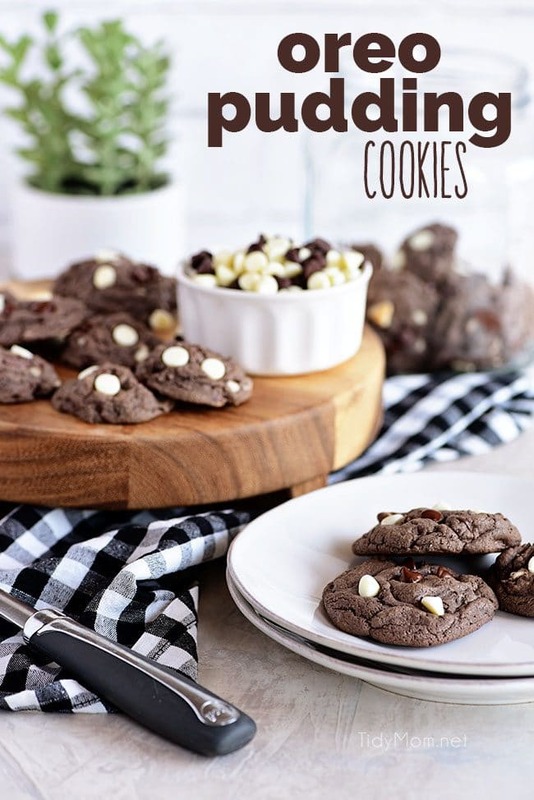 These Oreo pudding cookies are definitely my new favorites, but if you have someone who’s not about the cookies & cream life, check out some other cookie recipes, and I’m sure you’ll find the perfect cookie recipe for everyone! Or if this recipe has sent you on an oreo frenzy try this Easy Oreo Banana Cream Pie Cups Recipe. 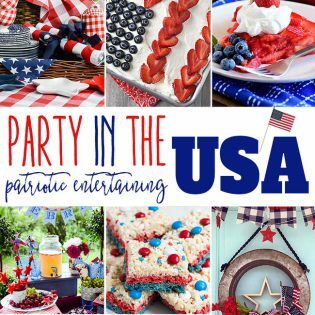 It’s the perfect light and fluffy dessert for summer! But you can’t go wrong with Oreo Fluff Pie or OMG….. Oreo pancakes!! 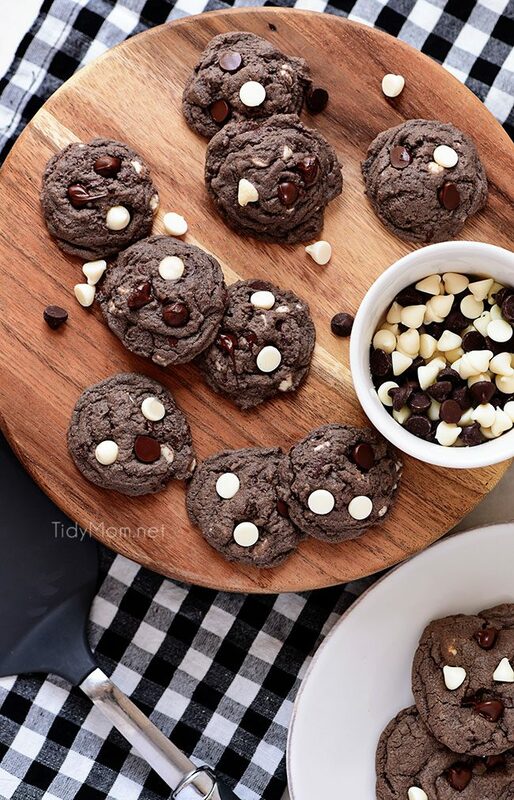 Like This Oreo Pudding Cookies Recipe? Pin It! Cookies & Cream Oreo Pudding Cookies??? Yes PLEASE! I can’t turn down a delicious cookie, and I have a feeling you won’t be able to either! 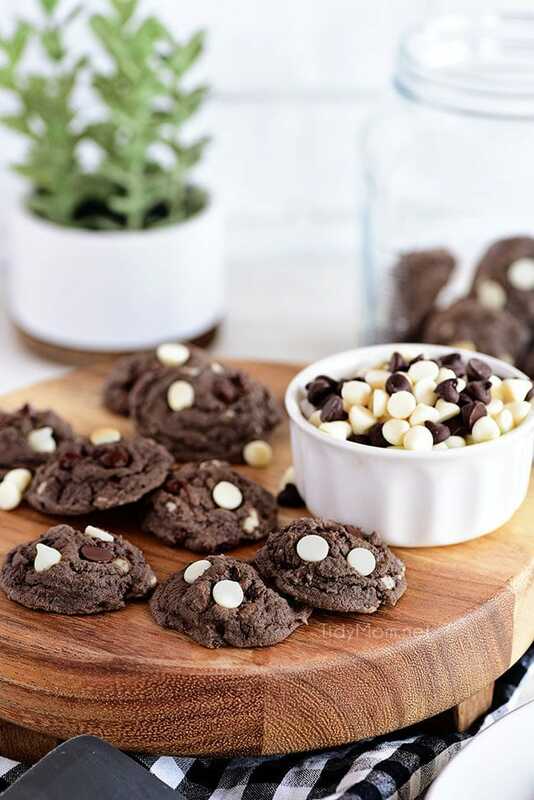 See The Recipe Card Below For Full Details On How To Make This Oreo Pudding Cookies Recipe. Enjoy! 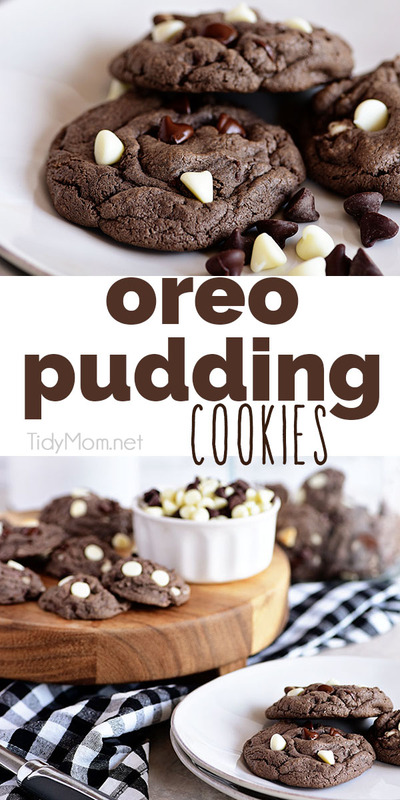 Amazing Cookies & Cream Oreo Pudding Cookies - So soft and incredibly easy to make. You'll love the burst of cookies & cream flavor in every bite! Using an electric mixer fitted with the paddle attachment, cream butter, and both sugars. Mix in vanilla and egg until smooth. Mix in cocoa powder and pudding mix ( don't make the pudding, just use the powder mix). Beat in coffee or water, flour, and baking soda until well blended. Stir in 1 1/4 cups of baking chips. Preheat oven to 350°F. Remove prepared cookie sheet from the freezer. Bake for 10-13 minutes (I baked the big cookies for 14 minutes), until the edges lose their sheen. I like my cookies slightly under-done, so I usually bake for the minimum amount of time. The coffee in the recipe helps make bring out a strong rich chocolate flavor. You won't actually taste the coffee at all. 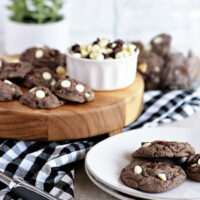 Don't skip the chill time because it will cause the cookies to spread too much while cooking. 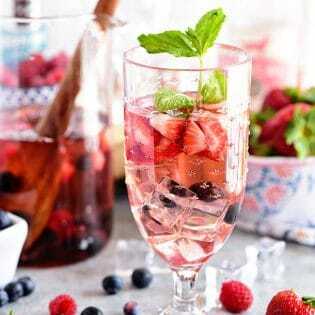 Look delicious, cant wait to try the recipe! This recipe is super genius!! I love pudding cookies. Your version looks great!! Yummy! My family will love these for sure! 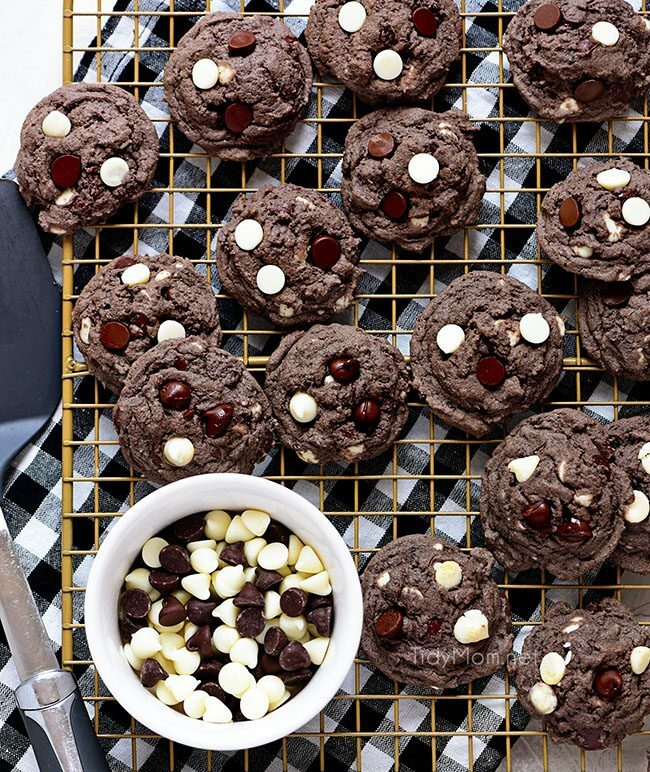 Gorgeous little cookies – I bet they taste as good as they look! I am totally with you on the soft cookie choice! These look fantastic! I’ll take two dozen of these! 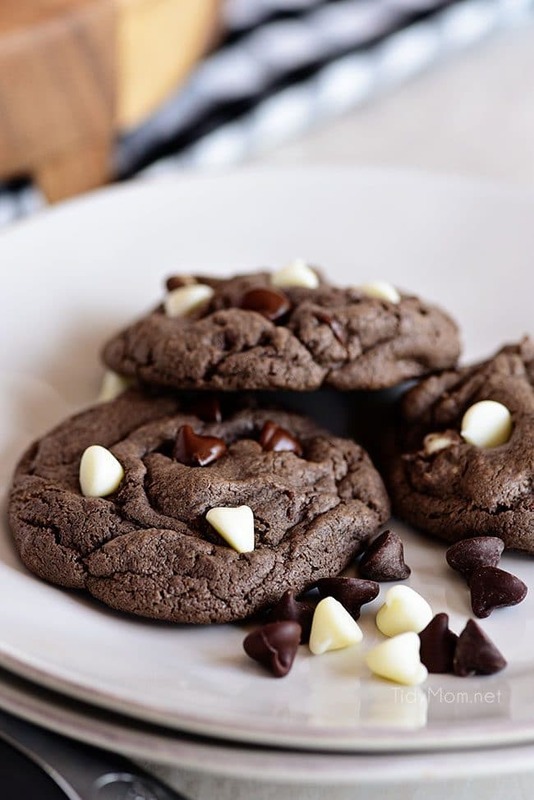 Great combination of flavors for an incredible cookie. Definitely making these and I have the cookies n cream pudding mix. But mine is a large box, could you tell me what size box you used? Thanks! I used a 4.2 ounce box! Hope you love them! Purrfect making these for our sister missionaries who love love love all your awesome recipes!! Thank you!! I’ll be making these soon! Love the cookies & cream chips!